When we think of workplace amenities, only the truly extraordinary or extremely whimsical tend to stand out: the ping-pong tables that migrated from startup garages to corporate campuses; the nap pods and executive dry-cleaning service; the pinball machines and chef-driven lunches. While these kinds of office perks can be useful signifiers of a company’s culture and values, the amenities that support effective work habits tend to go quietly unnoticed — despite their crucial contribution to the office’s overall productivity. 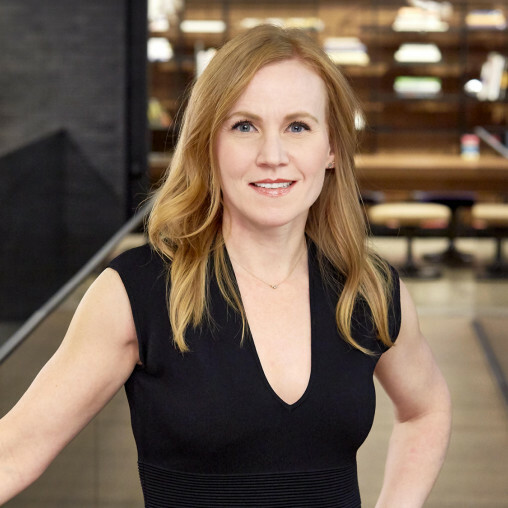 As the office landscape continues to evolve and companies grant their employees more freedom and choice to work where they like (whether inside or outside the office), our 2019 U.S. Workplace Survey research shows that the amenities with the greatest impact on effectiveness and experience are those that directly support the work needs of individual employees and their teams. Not all amenities are created equal, however, and the most meaningful amenities are those that really speak to the business and the employees’ expertise, while also offering a variety of work spaces and modes. Amenities with a non-work focus like lounges and break rooms only create a minor improvement in an employee’s experience at work — and they have an even smaller impact on employee effectiveness. On the other hand, employees who have access to spaces designed for team collaboration, ad-hoc group meetings, or individual focus work reported much higher effectiveness and experience scores. What’s more, we’re seeing that the choice itself can be an important amenity. What should be obvious now in our work-everywhere culture is that there’s no one-size-fits-all solution when it comes to how and where people do their best work. Take, for example, the work café. Compared to a break room or lounge, a work café borrows elements from hospitality and coworking spaces to offer a productive environment, as well as a change of scenery from one’s regular desk. 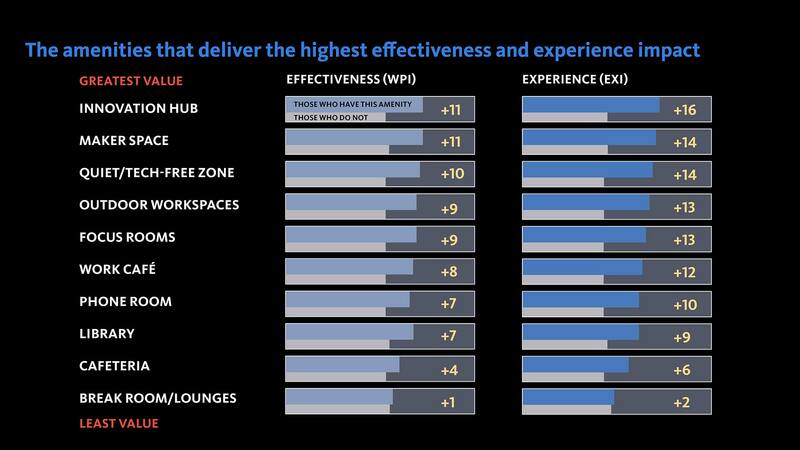 According to our findings, having a variety of work spaces to choose from is directly connected to a great workplace experience. Likewise, an innovation hub or maker space can offer employees the resources they need to work in a different mode. When you’re a spirits company, installing a bar in your office might seem like an obvious way to embrace the culture, but at Campari Group’s new North American headquarters in New York, four distinct bar-like experiences offer more than just a place for employees and guests to blow off steam. In Campari’s completely open workplan, these spaces provide employees with an alternate setting away from their workstations and conference rooms, while also fully immersing them in the brand. The Concierge bar doubles as the reception area and place to pause for an espresso. 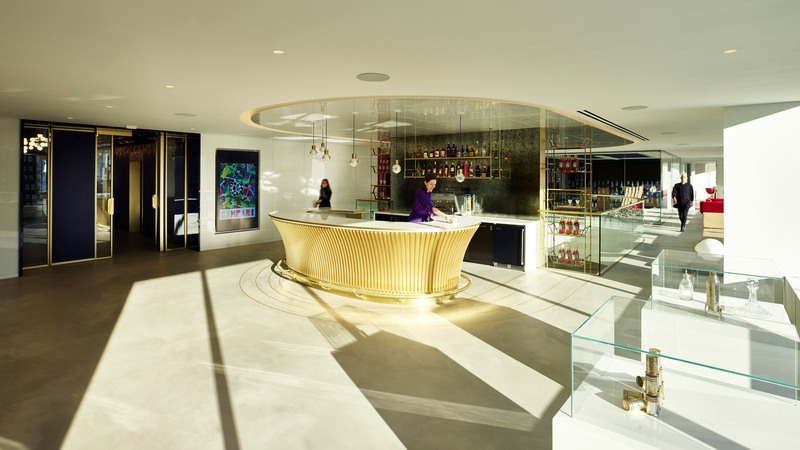 The Concierge bar, for instance, pulls double duty as a reception area where guests can enjoy an espresso with stand-up service like traditional coffee shops in Italy. The Café bar is where employees gather for meals while enjoying striking views of New York City and Bryant Park below. Additionally, the office space features the “Campari Academy,” which serves as an innovation lab where master mixologists and visiting brand ambassadors can experiment and create new craft cocktails. The Boulevardier lounge, with its nearly 100-year-old reclaimed wood bar, vintage chandelier, and hand-sketched portraits of master bartenders, speaks specifically to Campari’s place in New York's cocktail culture and provides the ideal setting for more engaging business meetings. When evaluating which workplace amenities are worth the investment, there’s one key factor to remember: the most effective amenities aren’t designed to escape work — they’re designed to support the employees’ freedom to work where they like while instilling them with a sense of pride for the values, heritage, and future of the company. At the intersection of individual work needs, the most impactful amenities are those that speak to the business itself and invite outsiders, new talent, or industry leaders to come experience the company’s unique thinking, innovation, and experimentation.